Pictured L-R: Joseph Wagoner, Product Manager for Wireless, Tour and Install, AKG Acoustics; Mike Clink, Producer/Engineer and P&E Wing Steering Committee Co-Chair; Maureen Droney, Sr. Executive Director, P&E Wing; Nathaniel Kunkel, Producer/Engineer and P&E Wing Advisory Council Member; Peter Chaikin, Senior Manager, Recording and Broadcast Marketing, JBL; Gregory Butler, Product Specialist, Lexicon, at the idyllic Conway Recording Studios for "From Mic to Mix" with Nathaniel Kunkel. Photo Courtesy of The Recording Academy® /Wireimage.com © 2012. Photographed by: Rebecca Sapp. 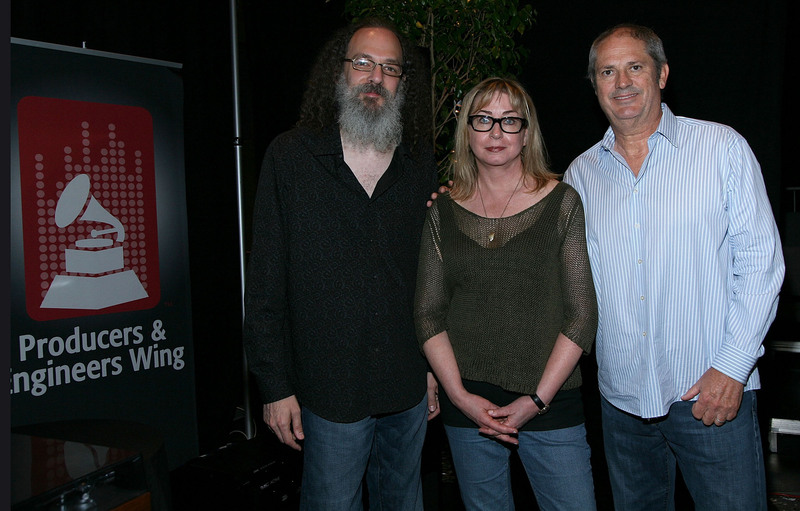 Pictured L-R: Andrew Scheps and P&E Wing Senior Executive Director Maureen Droney, at GRAMMY FutureNow, a day-long conference held on Saturday, June 23, 2012, at the Broad Stage in Santa Monica, Calif.. Photo Courtesy of The Recording Academy® /Wireimage.com © 2012. Photographed by: Maury Phillips. Pictured L-R: Engineer Chuck Ainlay and Dan Workman, P&E Wing Trustee Member / President & CEO of Houston's Sugar Hill Recording Studios, at "Quality Audio – The Future Is Now," in San Antonio, Texas. Photo Courtesy of The Recording Academy® © 2012. SANTA MONICA, Calif. (August 7, 2012) — As part of its ongoing mission to promote both the highest sound quality and the overall art and craft of recorded music, The Recording Academy® Producers & Engineers Wing® has been particularly visible lately, hosting several events highlighting industry leaders and sharing their thoughts on the current state of recorded music sound quality and its related issues and challenges. 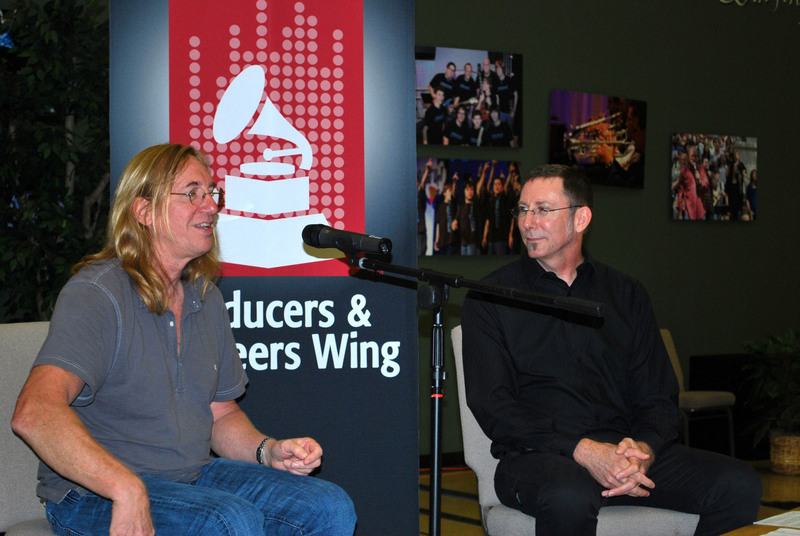 On June 16, in San Antonio, the P&E Wing and The Recording Academy Texas Chapter hosted "Quality Audio – The Future Is Now," featuring GRAMMY® award-winning engineer Chuck Ainlay (Miranda Lambert, Mark Knopfler, Lionel Richie). As part of the GRAMMY GPS: Texas Summer Speaker Series, this event offered members an up-close-and-personal opportunity with Ainlay, who discussed the current and future state of audio quality. Recently, Ainlay opined on the state of high-resolution audio in today's music industry: "Mastered for iTunes, HD Tracks and premier headphones are all new consumer indications that there is a demand for high-resolution audio. We have to stop thinking that just because people have been listening on ear buds to low-res downloads, that is the way it will always be. The music we record today must exceed the resolution of tomorrow." A highlight of GRAMMY FutureNow, a day-long conference held on June 23 at the Broad Stage in Santa Monica, Calif., produced by The Recording Academy Los Angeles Chapter, was a presentation led by GRAMMY-winning engineer Andrew Scheps (Adele, Linkin Park, Red Hot Chili Peppers). Titled "Lost in Translation," the presentation guided the audience through an auditory experience examining the difference between an artist's mastered track and different consumer formats including vinyl, CD, MP3, AAC and streaming. A breakout session followed during which a standing-room-only crowd got more "ears-on" time with different formats and participated in a question-and-answer session. 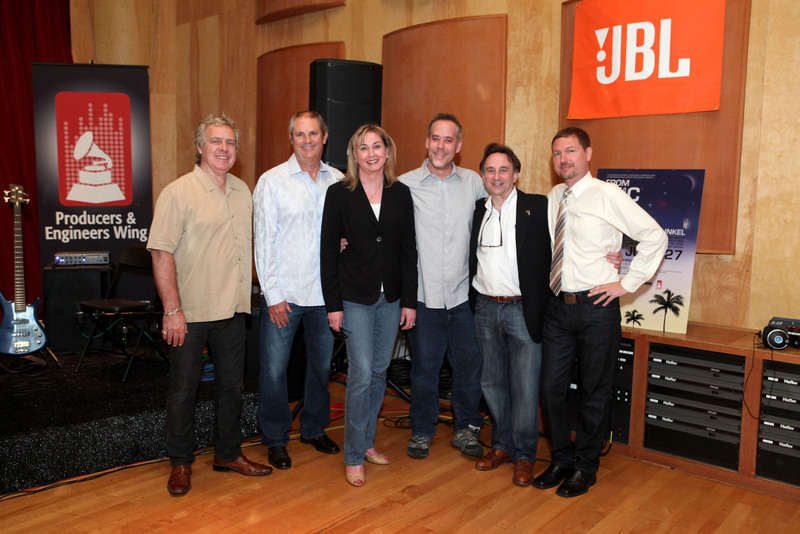 On June 27, P&E Wing members and their guests spent a perfect summer evening at the idyllic Conway Recording Studios in Los Angeles for "From Mic To Mix" with Nathaniel Kunkel, presented by Harman brands AKG, JBL and Lexicon. Following an outdoor reception with eco-friendly cocktails by VeeV, guests filled Studio C for welcome remarks by P&E Wing Senior Executive Director Maureen Droney, P&E Wing Co-Chair Mike Clink, Conway Studios Owner Buddy Brundo and JBL's Director of Marketing, Recording & Broadcast, Peter Chaikin. The main event featured two-time GRAMMY-winning engineer Kunkel manning the board in Studio C's 5.1 surround-outfitted control room. Attendees observed as he live-mixed two sets by singer/songwriter Elaine Faye, who performed on stage in Studio C's live room with her five-member band. The live room was also stocked with Aviom listening stations featuring AKG headphones, while Studio B housed Lexicon plug-in demos and offered the opportunity to be interviewed on camera for an upcoming Lexicon documentary. On July 12 the P&E Wing and The Recording Academy Washington D.C. Chapter presented an evening with George Massenburg at Omega Recording Studios in Rockville, Maryland. Massenburg, the inventor of the parametric equalizer and currently an associate professor of sound recording at Schulich School of Music at McGill University, is a GRAMMY and Technical GRAMMY® Award-winning producer/engineer whose credits include Linda Ronstadt, Earth Wind & Fire and Little Feat. His presentation, titled "Adapting To Sustaining Technology Without Selling Your Soul" delved into the transformative nature of music listening and asserted that the music industry is entering a new period where increased bandwidth and other innovations open the door for new appreciation of excellence in audio. Photo Caption: Pictured L-R: Joseph Wagoner, Product Manager for Wireless, Tour and Install, AKG Acoustics; Mike Clink, Producer/Engineer and P&E Wing Steering Committee Co-Chair; Maureen Droney, Sr. Executive Director, P&E Wing; Nathaniel Kunkel, Producer/Engineer and P&E Wing Advisory Council Member; Peter Chaikin, Senior Manager, Recording and Broadcast Marketing, JBL; Gregory Butler, Product Specialist, Lexicon, at the idyllic Conway Recording Studios for "From Mic to Mix" with Nathaniel Kunkel. Photo Courtesy of The Recording Academy® /Wireimage.com © 2012. Photographed by: Rebecca Sapp. Photo Caption: Pictured L-R: Andrew Scheps and P&E Wing Senior Executive Director Maureen Droney, at GRAMMY FutureNow, a day-long conference held on Saturday, June 23, 2012, at the Broad Stage in Santa Monica, Calif.. Photo Courtesy of The Recording Academy® /Wireimage.com © 2012. Photographed by: Maury Phillips. Photo Caption: Pictured L-R: Engineer Chuck Ainlay and Dan Workman, P&E Wing Trustee Member / President & CEO of Houston's Sugar Hill Recording Studios, at "Quality Audio – The Future Is Now," in San Antonio, Texas. Photo Courtesy of The Recording Academy® © 2012.